When tragedy strikes it often falls to families to fight for answers, for change and for justice. 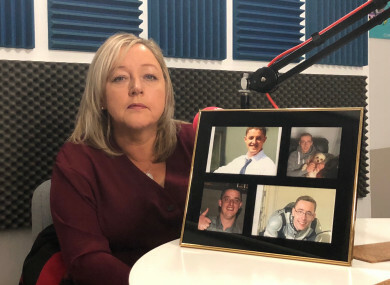 TheJournal.ie’s podcast Left Behind, speaks to those accidental campaigners about their attempts to make sure other families never have to experience their pain. IN THE SPACE of two-and-a-half years, Karen Docherty lost both her sons to suicide. You’re living life through a blur. To even get yourself out of bed every day. You’re dealing with your own grief and then I’m looking at my husband, my daughter, my mother. I feel so bad for all them and yet I’m still trying to keep myself going. Her eldest son Stephen began smoking cannabis at the age of 15 and by 17 he was addicted to heroin. In the four years before his death he was in and out of treatment, sometimes clean for months at a time. Docherty said she struggled with guilt in the aftermath of her son’s death as they were not talking at the time. Her younger son Graham had also had a silly argument with his brother the week before his death and for years afterwards he blamed himself. Described by his family as a studious young man, Graham finished his degree in software development at the National College of Ireland where he had received the highest marks in the 30 year history of the college in 2017. He then began working with an American technology company in Dublin. “He’d really big things ahead of him,” his mother said. On 18 November that year he turned 22 and that weekend he went out partying with friends. On the Sunday, he seemed agitated and when his mother asked him what was wrong he told her he had been smoking cannabis the two previous nights. He said it had made him anxious and he was finding it hard to relax or sleep. “I lost the head with him, roaring and shouting because he just knew that I have zero tolerance on drugs. And then of course I felt bad so I went up and I got back into bed with him and the two of us lay there for about two hours and we were chatting away about everything under the sun,” she said. Karen and Graham had both gone to the charity Console for counselling after Stephen’s death, but Graham had only attended three sessions. That Sunday he told her he felt like he needed to go back to counselling so he could talk about Stephen. The following day, Graham was at his dad’s house working from home as he still was not feeling well. Docherty said she spoke to him and told him to drink lots of water and to have some food. She napped for half an hour and when she woke up she had two missed calls from him. When she rang back he did not answer any of her calls. “I knew then he was gone as well,” she said. When she went to her ex-husband’s house, she found Graham’s body. Docherty said the counselling she had received after the death of her first son had given her coping mechanisms. But when she tried to access further counselling in the weeks after Graham died, she came up against long delays. “The beginning is when you actually need someone there, within 48 hours, not to counsel you even, just to be there. To know what you’re going through, what you need, if there’s anything they can do for you at all. You’re not thinking straight, you just can’t, you’re walking through a maze. Since Graham’s death, Docherty has been working to highlight the need for better access to mental health services and stronger support systems for families affected by suicide. I want to erase the stigma around suicide and mental health illness. Eight out of 10 suicides in Ireland are attributed to men and especially young men and I want people to know that it’s okay to talk. It’s okay to have problems. Listen to Karen Docherty’s episode of Left Behind here. A list of HSE and HSE-funded services can be found here. The Left Behind podcast is presented by TheJournal.ie’s Senior Reporter Michelle Hennessy, and produced and edited by Nicky Ryan. Email “PODCAST: 'I lost two sons to suicide - I want people to know it's okay to have problems'”. Feedback on “PODCAST: 'I lost two sons to suicide - I want people to know it's okay to have problems'”.